Ready to spruce up your garage? If you are, these ingenious garage organization DIY projects and more will sure fit your lifestyle. Garage organization is not a complicated nor an expensive task. However, it is important if you want to achieve that clean space where you can easily find anything. So, use this garage organization DIY projects and more to transform your garage into a functional, organized space without using up the area that you used for your cars. Garage floor doesn’t need to be plain and boring. Spruce it up by applying acid stain and make your garage more neat and organized. Cabinets are perfect for storing things and keeping the garage all neat and tidy. Depending on your need and preference, you can install garage cabinets you can use to store everything away. Talk about being organized down to the tiniest tool that you have! These wall tool holders are just very cost-effective and serve its great purpose where you can easily see everything and that saves you lots of time and trouble. DIY wall tile covering is a perfect choice if you want a really clean up garage space. Check your local Dollar Store for cheap tiles that you can apply to your wall and have that great space that is much better than with a concrete wall. Add a tool tower rack in the corner of the garage. It will be a perfect storage solution for your long-handled tools, such as brooms and shovels. Planning to have a mud room, but still, don’t have a space where to put it? Set it up inside the garage door and save yourself from cleaning every time someone comes in with muddy shoes. Create a peg rail organizer and keep your essentials off the floor. Have it at different levels to have enough room for longer items and then smaller items closer to the floor. It will make your garage look much tidier and pegs are inexpensive so hang as many as you need. Tiny drill bits are difficult to organize, easily misplace, and hard to find. So, this magnetic strips will keep your tiny drill bits completely organized and handy. A garage mudroom will reflect what you get to see when you get inside the house, better keep it properly organize to avoid misinterpretation. If you need inspiration how to, you can start checking the theme of your indoor wall color and from there you set you right foot forward with a bit help from your innovative imagination. Another great way of repurposing mason jars! Screw the lids at the bottom of a shelf in the garage and use it to store screws, nails, bolts and many other small items. This is super clever! Creating a sliding storage system on the garage ceiling saves you lots of space and possibilities are you could keep all your tools and other things in a place where you can easily reach them. If you think you have more garden tools than you can handle, this simple DIY project is durable, efficient, and smart solution to keep them all organized and eliminate the clutter. If you got some extra studs and your tools, kids toys, and other things lying throughout your garage are consuming too much space. Use your stud to create a garage storage and organize the clutter. Your DIY weekend will be a blast with this stud storage project. If cabinets and storage bins are not for you but still, you want to use your garage space efficiently, then here you will have several inexpensive and hassle-free garage organization solutions that will help you organize and redefine your old garage. Storing your things practically and efficiently saves you both time and money. Well-implemented DIY projects will help you achieve a space where you can store all unused stuff and things that you want to be out of sight from your children. The garage is frequently the dumping place for whatever stuff that no longer fits into the house. If your garage is in serious need of improvement, set aside sufficient time to put it right and have some help. I hope that with these garage organization ideas you’ve found what you’re looking for to put your garage in order. 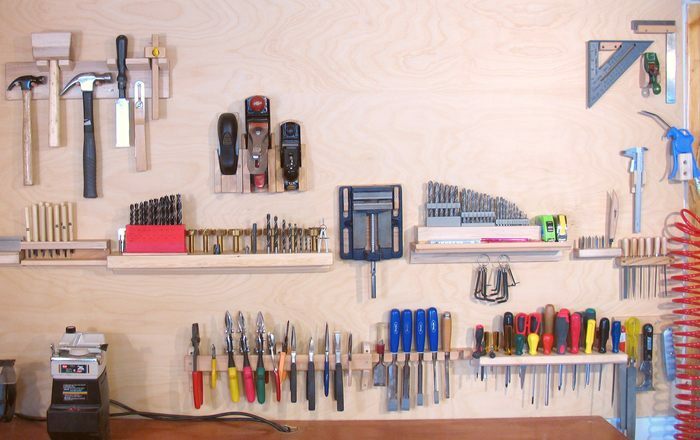 Which ingenious garage organization will you apply to your home? Let us know in the comments below. Need more organization ideas? Here’re 12 food storage ideas for small homes to maximize your space. Great post, I found these ideas very useful, especially when you love gardening but have little storage space. Thanks for sharing!